General Contractor: James E. Roberts-Obayashi Corp.
Lakeside Senior Apartments provides 92 affordable apartments to low-income seniors, including 32 homes set aside for formerly homeless individuals who are disabled. Built on on the banks of Lake Merritt, within walking distance to restaurants, grocery stores, parks, and several public transportation options, Lakeside offers numerous opportunities to help residents achieve independence, good health, and quality of life. Residents benefit from a robust set of supportive services, including community-building activities, case management, and continuing education classes. 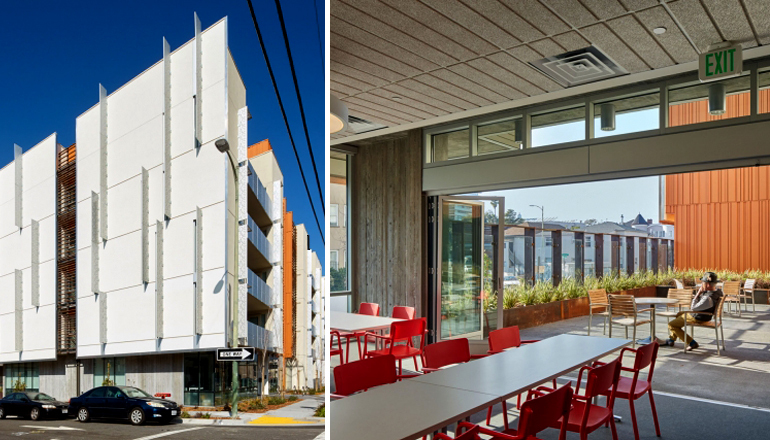 Elegantly designed, with two community kitchens, a wellness room, a community garden, a computer lab, a large community room that connects to a landscaped outdoor community space, and sweeping vistas of Lake Merritt and the Oakland skyline from the penthouse multi-purpose room, the 5-story building fosters many opportunities for community building and social interaction. Community Economics, Inc.’s mission is to increase the supply of permanently affordable housing serving the lowest income households. COPYRIGHT © 2019 Community Economics, Inc.